3 PTOLEMEE, C. / FRIES. (Geographicae enarrationis libri octo). Vienne (Dauphin�), G. Trechsel, 1541. In-folio de (1) f., 47 cartes � double page et (1) f. contrecoll� sur le contreplat inf�rieur. Couverture cartonn�e. Recueil comprenant uniquement les cartes, sans les cartes n� 27, 31 et 49. Fortes mouillures avec quelques moisissures affectant l'ensemble de l'ouvrage moins importantes en fin de volume. Nombreuses lettrines d�coup�es dans les cartes remplac�es par du papier ancien, affectant les cartes suivantes : 1-2-5-7-8-10-13-19-20- 23 et les cartes 34 et 35 en dehors du bois grav�. - Folio. Card board binding. Collection of maps. Only 47 maps of 50, following maps are missing : 27, 31 & 49. Maps hardly water staining with some mildew, less apparent in the second part. Ornamental initials on verso cut-out, affecting the map-image of the following maps : 1-2-5-7-8-10-13-19-20- 23 & margins of the maps 34 and 35. Sold as is. 402 x 277 mm. 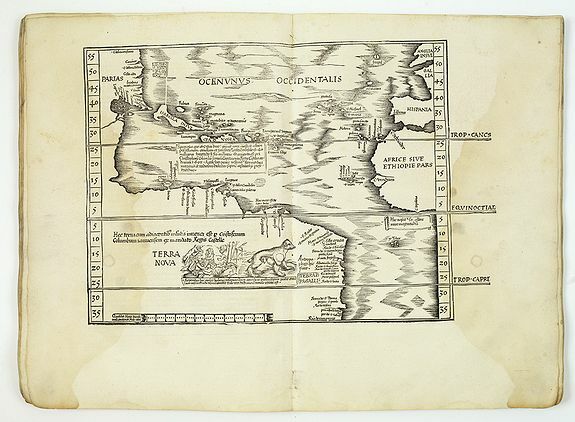 � Second edition of Michael Servetus' Ptolemy edition (maps only), illustrated with 47 woodcut maps (of 50) taken from the Strassburg edition of 1522, including L. Fries' world map of 1522 bearing for the first time the name "America" for the new world, and the Laurent Fries� "Terra Nova", based on the Geography of Waldseemueller. The woodcut map of the Atlantic Ocean depicts North Africa, Western Europe, Brazil, the Caribbean, Gulf of Mexico and Florida; the sea is decorated with a striated wave pattern, text block with text on Columbus's discovery in 1492, South America decorated with images of natives and an opossum. The sphere by Albrecht D�rer is pasted on the inside back cover. 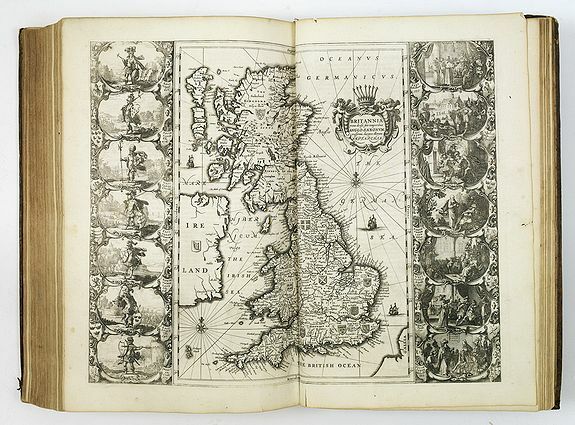 This reduced version follows the arrangement of Waldseemuller's edition, with the maps divided into two sections : the Ptolemaic maps, with the world map at the end, and then the series of modern maps. The fourth edition utilising Lorenz Fries's woodcut maps was published in Vienne, Dauphine, in 1541 by Gaspar Trechsel, and sold by Hughes de la Porte in Lyons. - Adams P 2226; Baudrier XII, 256; Mortimer 450 Anm. ; Phillips 366; Shirley T.PTOL-7g; Alden-L. 541/9; Sabin 66485 ; Fulton, Servetus 10 u. S. 32 f. ; Burden 4. 4 JANSSON, J. Spectacle de l'Univers ou le Tableau de toute la Terre... J. Jansson, Amsterdam, 1658. In-folio de (1) f. de titre, 32 pp., 62 cartes, (1) f. Veau brun usag�, mors sup. en partie fendu, coins �mouss�s (reliure de l'�poque). Papier uniform�ment bruni, rousseurs. - Folio. Braun calf used (original binding). Overall browning and brown spotting. 480 x 310 mm. - Koeman/Krogt, Atlantes Neerlandici, I, 1:961A.